Raising multilingual children can be challenging and families often seek support throughout their journey. While there are many books written on the topic of raising bilingual children, there aren’t too many that consider raising trilingual, or multilingual children. Julia Festman, Gregory J Poarch, and Jean–Marc Dewaele are researches on multilingualism, and are also parents of multilingual children themselves. Together they are the authors of the newly published book, “Raising Multilingual Children”. 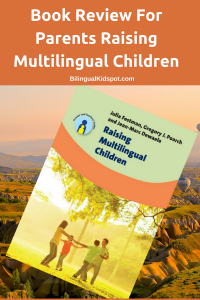 Based on each of the authors’ different family experiences, this book is an informative guide with research based advice, along with many practical ideas and tips on how to raise nurturing happy multilingual children. This post may contain affiliate links to help run the site. Jean-Marc Dewaele is the father of Livia, 20, who speaks English, Dutch, French, some Spanish and some martial art Japanese. Jean-Marc works at Birkbeck, University of London, in the UK. Gregory J. Poarch is the father of Loic, 15, who speaks Dutch, English and German. Gregory works at the University of Munster, Germany. Julia Festman is the mother of Aya, 12, and Noam, 8 who speak German, English and some Hebrew. Julia works at the Pedagogical University Tyrol in Austria. The idea of writing this book came up while the three were chatting over an aperitivo at a “trilingualism conference” in Bozano in the north of Italy. Definitely my favourite part of “Raising Multilingual Children” is the metaphor they use at the start of the first chapter from Colin Baker 2007. The authors talk about parents being the gardeners, and children the gardens. They talk about how much attention is needed to keep these gardens growing. They use this metaphor throughout the book and it really is a great way to look at the multilingual parenting journey, and to understand how much work is actually involved. It is not easy, and sometimes things don’t always work out how you plan, even with all the nurturing you do. In the first chapter the benefits of multilingualism are outlined. They give you great reasons why you should introduce languages early on. I, myself can go on and on about the benefits of children speaking multiple languages! It is a great introduction for parents who are still not sure about taking this path. The second chapter dives straight into their personal experiences giving details of how the authors raised their own multilingual children. The first and main story is that of Professor Jean-Marc Dewael. Jean-Marc, who’s daughter Livia is now 20 years old, tells of how when she was born in the UK, he spoke French with Livia, his wife spoke Dutch with her, and they spoke English together. He goes on to explain how Livia was also exposed to Urdu through a Pakistani babysitter. The professor admits himself that he was a bit sceptic about the fourth language and was worried about her language acquisition initially. However, his worries of course turned out to be unfounded. As we know from extensive research, children are in fact able to understand multiple languages from a very early age without problems. He also tells of of Livia’s many academic achievements through her childhood. And then he goes into detail describing how their family dealt with the challenges which arose while Livia was growing up. What I really thought was interesting is that the Professor’s family story also includes a letter that Livia wrote when she was 16 years old. In this letter she describes how she felt about her multilingualism and how it was affecting her. While we hear a lot about how parents deal with raising multilingual children, we rarely hear from the children and what they thought of the experience growing up so it is nice to hear from the other side. Julia’s two children, Aya and Noam were raised with three languages from birth, English, Hebrew, and German. English was initially only a passive language used between their parents, but later became one of the languages used as family. She tells of how Hebrew began to fade when Julia’s husband passed away, and their exposure to the language was dramatically reduced. Gregory’s son Loïc was raised speaking two minority languages at home, English with his father, and Dutch with his mother. Germany was the community language and he went to a bilingual English – German daycare. Greg explains how Loïc’s language proficiency varies depending on his exposure to each language and gives some interesting examples on how he deals with situations such as speaking the minority language outside, and when other people are around. Each of the authors has a different story with different circumstances, however they do share one main thing in common. Each of the authors is multilingual themselves. Therefore, it should be noted that the book doesn’t really include much guidance on situations where one parent may feel isolated or detached during family conversations. For parents who don’t speak their partner’s languages this can be a difficult challenge along the multilingual parenting journey. 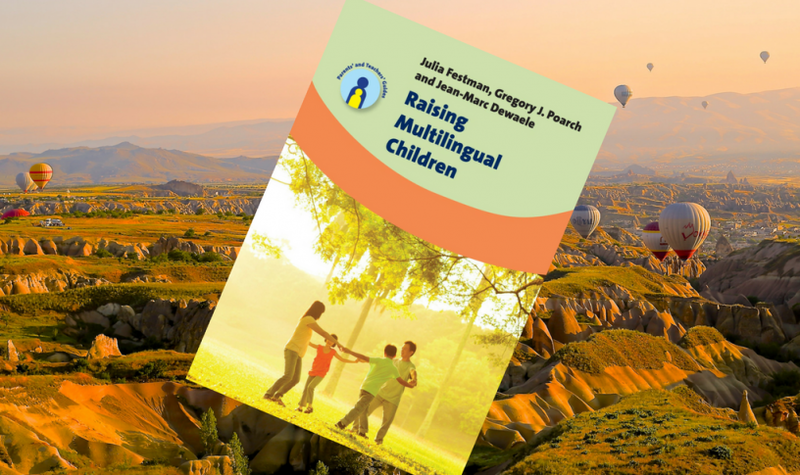 In the third chapter, the authors summarise the different ways to raise multilingual children describing the different strategies families can use depending on their circumstances. They then go on to talk about how much input is needed for a child to become proficient in each language. Chapter four emphasises family goals and what I thought was quite useful is that they provide tables to fill out using your own family information in order to determine the best way for you to move forward according to those goals. Finally, the last chapter gives ideas and practical tips with examples on how you can create a multilingual home, and give your children exposure to the languages they are learning. While they don’t go into extensive detail, there is a great overview of advice on how to deal with the challenges that will rise, and how you as a family can try to overcome them along the way. For example, what parents can do when children make mistakes, mix languages, or when they refuse to speak a language altogether. 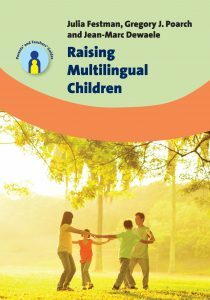 What is very useful is that in all five short chapters of “Raising Multilingual Children”, the authors draw on their own experience giving examples from their family stories on how they dealt with particular situations. You can find Raising Multilingual Children here on Amazon“Keep watering the garden” even if your child doesn’t speak back in the minority language, as long as they hear it, it is something. For further information you can listen to this podcast with Professor Jean-Marc Dewaele where he talks about “Raising Multilingual Children” and gives further information on his own family story. 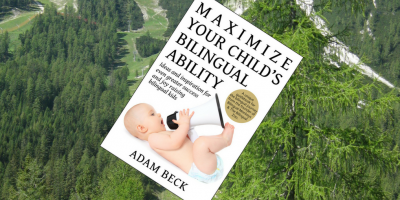 If you are raising a bilingual child, you may be interested in “Maximize Your Child’s Bilingual Ability” which I also recently reviewed. Entry is available worldwide. This giveaway closes 26th July 2017. Bilingual Kidspot is an Amazon Affiliate. You can read more here. Thanks for your support. Hello. This is a very nice summary of the book. I am looking for more information on how to raise my son multilingual. My son is 2 years old. I speak to him mostly in Spanish, but have chosen a time of day when I speak to him in English. My husband speaks French to our son, and we live in France. He is just starting to speak in longer phrases. He speak and understands French and Spanish well, and he understands English but will not reply back in English. Looking for tips on how to naturally expose him to more English. It is helpful to read about other families’ experiences. Hi! My son is only 7 months old. We live in a bilingual environment: almost everyone speaks Russian and Ukrainian. However, I decided to teach him two more languages, namely English and French. Though, I’m not sure how to expose him to all of these languages, because this is only me, mom, who speaks them proficiently. I do want my son to become multilingual, because it will broaden his mind and he will be free to choose his own path, and the most important thing is that he will have more time to spend for other things. I want that knowing three or more languages wasn’t an aim, but a means for him. My wife and I are both American, but I’m doing my best to raise my two children (girls, aged 5 and 2) to be bilingual (English/German) by speaking to them exclusively in German. I didn’t start learning foreign languages seriously until I was 20 – but I then ended up living abroad for several years in Germany, Ukraine, and Hungary. I want to give my daughters access to multiple languages and cultures from early on in a way that I wasn’t able to, since it has greatly enriched my life, and I want them to experience the same. I’ll admit that I’ve been feeling rather discouraged lately, so I’m hoping that this book will have encouragement and ideas to make my speaking German with them more effective, and to make it fun for me again. I am Brazilian and my spouse is South African. We live in the US and we have 7 month-old twins. Each one of us speaks to them in our native language (Portuguese and Afrikaans). We speak English between the two of us and the twins attend daycare (English). The most important factor for us to want to raise them bilingual is heritage. We want them to be able to communicate with our families and to be proud of being multicultural. Hi I’m Kathy. Our son is still pre-speaking, but we’re raising him with Mandarin (my mother tongue) and Spanish (my husband’s second language – his first language is similar to Catalan). Kia ora! My name is Te Ataahia and my husband and I are the lucky parents of our two year old multilingual. I’m Maori (indigenous NZ) and grew up bilingually with Maori and English. My husband is Italian and learnt English proficiently, and we both speak Spanish. We’ve chosen to raise our son with our three family languages to enhance his sense of ‘self’, and to allow him the opportunity of connecting with his loved ones in deeper ways through communication. We’re also fully aware that my indigenous language is under threat of being lost, so in our own small way we try to keep it alive! We speak Italian at home and between ourselves (we live in NZ), and while English is the main spoken language of this country, our son’s daycare is bilingual (Maori/English). Our hope is that through extended family, attending Maori playgroups, and reading books, singing songs etc he will be exposed enough to the Maori language that he will comfortably attend a total immersion Maori school when he’s older. For now, it’s about enjoying all three languages naturally! Thanks for providing me a very interesting information! My name Trang and my family is living in Vietnam. My husband and I can speak English fluently , so we are raising our 3 years old daughter by both Vietnamese and English. We would like to create a good chance for our kid to be confident in any international environment. I am a mother of a 3-year-old girl. She is speaking French, English and soon will be exposed to Mandarin. We both, the parents speak French at home but since she is going to a English preschool, English will be her language of education. Beside that, I am a French teacher. I teach French to all kind of profiles and students from 2 years old to 60 years old. Really loved reading this review! My name is Arina and live in Australia. My husband and I are both Dutch and raising our children in Dutch alongside English. The reason being it is our native tongue and we believe it important to give them a bit of our culture and language, the advantages of knowing a second language and the ability to communicate with friends and family back in the Netherlands. My 5 year-old boy speaks Spanish (as mother tongue), as well as German and English, as he attends a bilingual day-care/kindergarden since he was 19 month -old. He has passive knowledge of Portuguese (his father tongue). Likewise, to my surprise, he easily pronounces French words and sentences (perhaps due to his having been born in French-speaking Switzerland and lived there till he was 8 month-old) – We live in Vienna, Austria. I speak English as my native language, but also know German and French. My husband was raised with 2 native languages; Hindi and Punjabi. He also speaks Urdu fluently as his grandfather speaks it with him. We are currently pregnant with our first child – 7 weeks left to go – and will strive for our child to speak multiple languages from birth. My husband will only speak Hindi and Punjabi with the child, whereas I will only speak English. French, German, and Urdu will be introduced, but not used extensively. I believe it’s so important now to be able to speak more than one language. The world grows smaller with each passing day, and lives become more international. Being monolinguistic really narrows your understanding of our planet and reduces your chances for advancement at a later age. My name is Caitlin, and I am raising my son Aaron bilingually with English and Spanish. We chose to raise him bilingually for many reasons. First of all, my husband’s first language is Spanish and many of his family members only speak Spanish, so if Aaron wants to talk to Abuela, he has to speak Spanish. Secondly, I am an educator, and in my studies, I have come across a wide array of research supporting the cognitive benefits of bilingualism. So in the end, the most important things for our decision were communication within our family and doing what’s best for the cognitive development of our son. Fabulous ! I absolutely need a copy ! I’m raising a child in three different languages: Dutch because it’s my mothertongue, French because we live in French Guiana and Ndyuka which is the mother tongue of his dad, a maroon from Suriname. I’m also training teachers to teach multilingual and multicultural pupils ! The book will thus be twice as useful ! I am Italian and my husband is Indian. We live in London and we are raising our daughter to learn Italian, English and Gujarati. I would love to win this book as my daughter is only 13 weeks old and I am want to teach her languages I the right way. We are parents of a lovely 2 year-old girl living in the US! She’s exposed to Spanish, English and Cantonese and it’s amazing how she has started using those languages to communicate with us. I think this book will be perfect to support our decision to raise a multilingual child. I can’t wait to read it !! Our 3 year old daughter is fluent in English and Spanish. She can also understand Farsi and Mandarin, she can sing songs in these two languages and she can also reply using common phrases. I am a polyglot and so is her dad. Being multilingual is something really enjoyable: you can research and learn more easily and, of course, you can get to know so much interesting people! Why not giving her the opportunity to grow in such a rich and exciting environment? Hi! How were you able to introduce Mandarin? I am thinking of introducing Mandarin to my grandson, however I do not know Mandarin. I talk to him in Spanish and American Sign Language. His mom talks to him in Tagalog. We all speak to him in English. I hear Mandarin is very beneficial if you want the children to develope a perfect pitch in Music. I am curious to know how to introduce. I chose Mandarin for my child for many reasons: as you say, it is a tonal language, it’s also very widely used, it’s part of a very interesting, ancient culture, it’s becoming more and more influential, it has nothing to do with the IndoEuropean languages she is also learning (speaking Spanish and English should be helpful for her to learn other Romance and Germanic languages, in case she needs/wants to do it in future) and also because I could always support her learning of several European languages… but not Mandarin. So… how do I encourage her to learn a language I don’t speak? Firstly, by starting friendship relationships with other Chinese families raising their little bilingual children nearby. Building a sense of BOND, group, safe community… is very important for children. Learning an unnecessary language is meaningless for them. Now that our child is 3 years old, it is great to see how she can engage in play with the children of our friends and family relatives, regardless of their native language: Mandarin, English, Spanish or Farsi. Secondly, by increasing ACTIVE PLAY with the help of Chinese students who sing, read, play and do activities with her at home on a regular basis. I provide the students ideas for multisensory, hands-on learning and I also ask all our friends to find us books, songs, cartoons… we try to use them for learning at home and I show interest in learning Mandarin myself. If I engage in the activities, our child is more willing to use the language, e.g. we pretend it is my birthday party and she immediately starts singing Happy birthday in Chinese. After some months, the students have to return to China but, while they are here, I care for them, I encourage longlasting bonds, I create a photo album for my child to remember her Chinese friends and I hope we can also visit them all in China when she is older. Youtube also offers the opportunity to increase exposure by watching children songs and TV series in Mandarin such as Badanamu China songs, Qiaohu, Pocoyo Chinese episodes… It is not the same as human interaction, but it helps to keep the sounds of Chinese flowing in the air… anytime. Quite a lot of work, as you see… ? but it is worth it! ?? I hope it is helpful for you and your grandson. Hi! My name is Annie and I am teaching my son Vietnamese and English (with French and Spanish sprinkled in, I am versed in French and my husband is versed in Spanish). The reason for this is because we are both Vietnamese American and we have family from France, hence the reason for Vietnamese and French. We also speak fluent English and reside in California, where learning both languages of English and Spanish would be beneficial to our son. It will also give him an understanding of languages and cultures and I want him to have awareness of his roots, but also of other cultures around him and embrace them all. My daughter is 2 years old. I speak German with her, and my husband speaks Hindi. We have virtually no family in the U.S. so we are doing this as a way of keeping her connected to her relatives. I myself grew up in a trilingual household (German + Japanese) so I know what worked and what didn’t for me. But that’s only one perspective so I’d be very interested to read what others experienced since my daughter may experience things differently! Great detailed book review! We are US monolingual parents raising our children trilingual. We speak English. Our children (ages 5 and 7) have had a Korean nanny since birth, which we continue to support thru tutoring and Saturday school. In addition they attend an immersion school for German. I strong feel that multicultural exposure and appreciation is essential in our interconnected world. While it is challenging to keep it up, we are committed. We hope that it could be offered at a school that also offers a Spanish Dual Language Program, therefore immersing the children in two languages simultaneously. IT) Dutch, Italian, English because I want them to be able to communicate with all family members and friends in the Netherlands, without feeling excluded. And to have more options for studying when they are older. Thanks for the review! I l love the book series, and have read several other books multilingualism. We are an Italian-German couple living in California (US) and are raising our three boys (9, 7, 5 yrs) in Italian, German, and English. Would love to be entered into the draw.